Assemblymember Al Muratsuchi (D-Torrance), one of several Asian American legislative candidates in Tuesday’s midterm elections, defeated his Republican opponent and won another two-year term. With all precincts reporting, Muratsuchi had 71,439 votes (57.77 percent) to former Torrance Mayor Frank Scotto’s 52,218 (42.23 percent). First elected in 2012, Muratsuchi lost to Republican David Hadley in 2014, then regained his seat in 2016. He was referring to the Scotto campaign signs that seemed to outnumber the Muratsuchi signs throughout the South Bay district. “I remember in 2014 we didn’t quite get the results that we wanted. And a couple of days after the election, Al and I sat down … What I remember about Al is that what he was concerned about was not himself, what he was concerned about was not his career. He was concerned about the community and concerned about the extent to which the community would be listened to and the extent to which the community would get the representation that it deserved. He concluded, “The thing that I love about the South Bay is that we have such a beautiful diversity that’s represented here in this room. Whether you live in Harbor City … Palos Verdes … Torrance … the Beach Cities … Lomita or the beautiful city of Gardena, Harbor City, Harbor Gateway, El Camino Village, we represent the beautiful diversity that is the South Bay. The Election Night party at the Holiday Inn in El Monte bore a mood of cautious celebration, and began to break up as midnight approached with many results still not in. 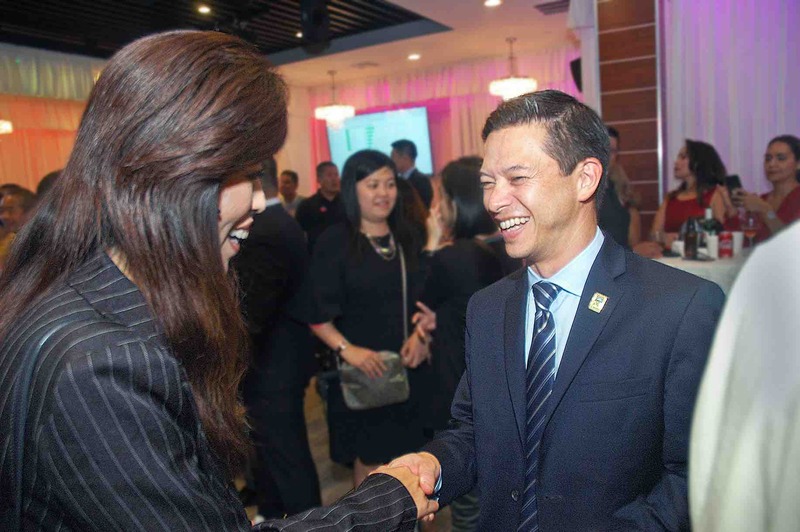 Assemblymember Ed Chau (D-Monterey Park), who was running for re-election in the 49th Assembly District, thanked supporters for what he called a hard-fought battle. “Your vote validates all of the work we do,” Chau told the gathering. Results on Wednesday showed Chau comfortably ahead with 48,506 votes (68.85 percent) to Republican Burton Brink’s 21,946 (31.15 percent). Chau was first elected in 2014. Rep. Judy Chu (D-Pasadena) was very direct in most of her comments, insisting, “The people of America stood up to Trump” in the midterms. Chu said in taking control of the House, the Democrats can be a check on the White House. As a member of the House Ways and Means Committee, she vowed to subpoena the president to release his personal tax returns, a disclosure he has repeatedly resisted. 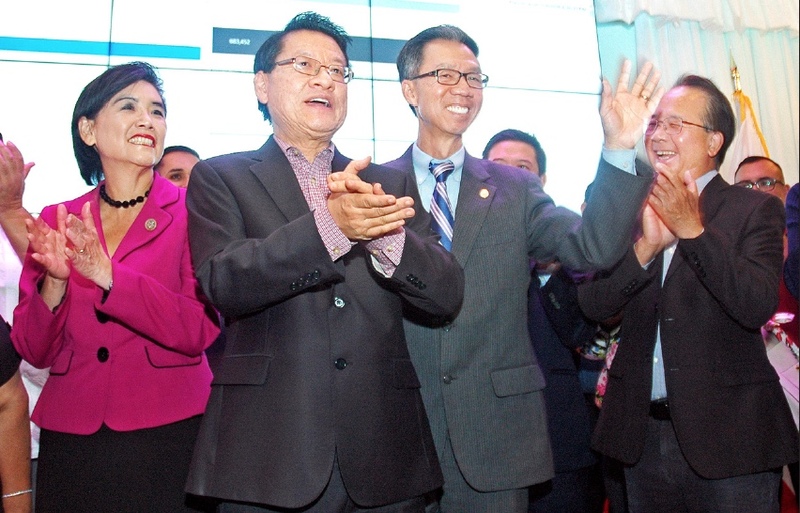 “We finally get to set the agenda,” Chu said. In the 27th Congressional District, Chu easily won re-election with 99,584 votes (79.43 percent) to fellow Democrat Bryan Witt’s 25,785 (20.57 percent). Chu, who chairs the Congressional Asian Pacific American Caucus, has been in office since 2009. Her husband, former Assemblymember Mike Eng, was running in the 22nd Senate District. Results on Wednesday showed him behind fellow Democrat Susan Rubio, who had 67,903 votes (52.70 percent) to his 60,940 (47.30 percent). Eng previously served as mayor and councilmember of Monterey Park and a trustee of the Los Angeles Community College District. 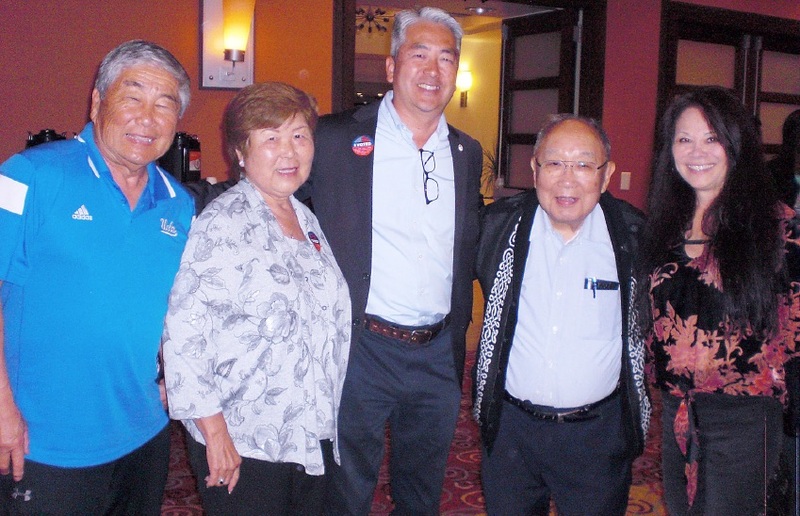 Alhambra Mayor Jeffrey Koji Maloney joined in the celebration, saying he was happy with the Democrats’ gains, even if the rumored “Blue Wave” didn’t quite materialize. 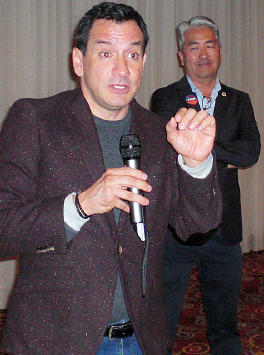 As the results seemed to be stalled in coming, El Monte Mayor Andre Quintero gave remarks to essentially close the festivities, and reminded those in attendance that the work of his party has just begun. In the 33rd Congressional District, incumbent Rep. Ted Lieu (D-Manhattan Beach) finished far ahead of Republican Kenneth Weston Wright, 144,380 (68 percent) to 67,939 (32 percent). In the 34th Congressional District, incumbent Rep. Jimmy Gomez (D-Los Angeles) defeated Green Party challenger Kenneth Mejia, 70,695 (74.19 percent) to 24,593 (25.81 percent). Mejia, a Filipino American, is a board member of the Wilshire Center/Koreatown Neighborhood Council. In the 39th Congressional District, which covers parts of Los Angeles, Orange and San Bernardino counties, Republican Young Kim was leading Democrat Gil Cisneros, 76,956 (51.3 percent) to 73,077 (48.7 percent) with thousands of provisional, late or mail-in ballots remaining to be counted. If elected, Kim — a former member of the Assembly and former aide to outgoing Rep. Ed Royce — would be the first Korean American woman in Congress. The district includes Fullerton, Buena Park, Diamond Bar and Yorba Linda. In L.A. County only, Cisneros led Kim, 56.20 percent to 43.80 percent. In the 24th Senate District, which includes the Los Angeles neighborhoods of Boyle Heights, Highland Park and Eagle Rock, a battle between two Democrats ended with Maria Elena Durazo receiving twice as many votes as Peter Choi, 88,652 (66.95 percent) to 43,761 (33.05 percent). Choi, a nonprofit director, previously ran for the seat in 2014. The district is currently represented by Democrat Kevin de Leon, who unsuccessfully challenged U.S. Sen. Dianne Feinstein. In the 34th Senate District, which includes parts of Los Angeles and Orange counties, incumbent Janet Nguyen (R-Garden Grove) was ahead of Democratic challenger Tom Umberg, 82,835 (53.5 percent) to 71,878 (46.5 percent). Nguyen was first elected in 2014 and previously served on the Orange County Board of Supervisors. The district includes Long Beach, Fountain Valley, Los Alamitos, Santa Ana, Seal Beach, Westminster, and parts of Anaheim, Huntington Beach and Orange. In the 53rd Assembly District, incumbent Miguel Santiago (D-Los Angeles) beat fellow Democrat Kelvin Hee Young Jang, 35,656 (71.07 percent) to 14,512 (28.93 percent). Jang is an attorney and a Democratic State Central Committee delegate. In the 55th Assembly District, which covers parts of Los Angeles, Orange and San Bernardino counties, incumbent Phillip Chen (R-Brea) won re-election with 57,086 (57.1 percent) to Democrat Gregg Fritchle’s 42,913 (42.9 percent). The district includes Diamond Bar, Walnut, West Covina, Chino Hills, La Habra, Placentia and Yorba Linda. First elected in 2016, Chen previously served on the board of the Walnut Valley Unified School District and ran for Assembly in 2014. In Kern County, incumbent Assemblymember Vince Fong (R-Bakersfield) was overwhelmingly re-elected with 70,919 (73 percent) to Democrat Nick Nicita’s 26,219 (27 percent). Fong was first elected in 2016 and previously served as district director for U.S. House Majority Leader Kevin McCarthy. The district includes Bear Valley Springs, Oildale, Maricopa, Ridgecrest, Taft and Tehachapi.